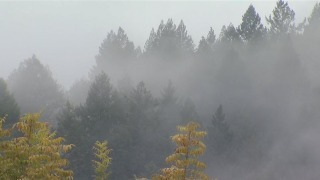 File image of Santa Cruz Mountains. A 12-year-old girl who went missing in the Santa Cruz Mountains Saturday afternoon was found Sunday morning, a sheriff's official said. Laura Wells-Lucas was reported missing at 1:15 p.m. Saturday and was found around 8:30 a.m. Sunday, and "we're elated," said Santa Cruz County Sheriff's Lt. Fred Plageman. Wells-Lucas was hiking with an adult Saturday in Zayante, a census-designated place in Santa Cruz County, and the two got separated, Plageman said. Neighbors who were preparing to join the search for the girl spotted her Sunday morning on a nearby property, he said. "When it became daylight, she (Wells-Lucas) started walking, got lost a bunch of times, she got to a piece of property" and neighbors recognized her, he said. "We had a huge search and rescue effort organized," Plageman said. "We had 25 people looking for her Saturday and sent out a helicopter overnight," he said. "This morning we had about 50 searchers" and were about to begin looking when they learned the girl had been found, Plageman said. He said about 50 more volunteers were on their way Sunday morning. Marin County Search & Rescue from the Marin County Sheriff's office, as well as representatives from the Santa Clara County, Solano County and Monterey County sheriff's offices, were recruited for the search effort, he said. Plageman said a medical team was sent to the girl's home to perform a medical exam after the Santa Cruz County Sheriff's Office learned she had been located. "She was a little weary," he said of the girl's condition. "It was 62 degrees at night, she wasn't that cold. She was a little thirsty."